I really enjoy making new year’s resolutions. I know that they are kind of kitschy and it’s quite likely that I won’t accomplish everything on my list, but I find that it helps me at least start the year off right. This year, instead of thinking about my list as resolutions, I’m mentally thinking about it as things I will do. Of course, I could fall short of things on the list still, but I think by stating it like this it made me be more focused and less flighty about my items. So here is my list! Be sure to share your list in the comments! For the last few years, I’ve been really trying to improve my running. I was getting really good and then I tore my ACL two years ago. This year I re-injured the SAME knee and had to have a second surgery in August. Finally, I’m feeling good about my knee though and am on a much better physical therapy routine. This year I will get comfortable running 20 miles per week. Right now I’m doing about 12-15 miles per week so this is only a modest increase and I will work slowly to get there. I know my ideal body weight. It’s 175 pounds. I’ve wavered around that weight for many years but always seem to bounce back up to 185ish which is where I am now. Granted, I don’t feel overweight or anything, but I think it would be good for me to trim a few pounds. I’m not going to lose this weight all in a month or anything crazy. I will gradually take it off over the year though and be at that weight at the end of 2014. Obviously, this thing and the 20 miles per week thing go hand in hand! Don’t worry. I’ll still post dessert recipes. I’m a firm believer in moderation! For a while there I was having fun experimenting with new cuisines, but I’ve been in a rut lately. I tend to fall back on Tex-Mex, Italian, or some sort of Asian fusion. These are solidly in my wheelhouse now which is why I want to branch out into something different. I’m thinking something African or Caribbean? My cookbook is being published for real in April of this year. It’s 99% done. I’ve seen the cover (it’s awesome) and the entire book laid out in PDF format. I haven’t held a printed copy in my hot little hands yet, but that’s coming soon. I refuse to be one of those people who starts pre-selling the book months before it comes out. Don’t worry. You will hear plenty about it in the next few months though! This humble little site has outgrown itself. There are over 1,500 posts and recipes on Macheesmo right now and it’s damn near impossible to find anything. Not to mention that a number of pages are broken, it looks bad on any mobile or tablet device, it loads like a snail, and sometimes I wonder why anyone reads it at all! This will all change in the next few months. I’ve been working with an amazing design company and we are rolling out a spiffy new site in the next month or two. It will be slick, functional, fast, and fun. I think you will love it. Those are my plans for 2014! I hope you all have a great new years! What will you DO in 2014? Leave a comment! 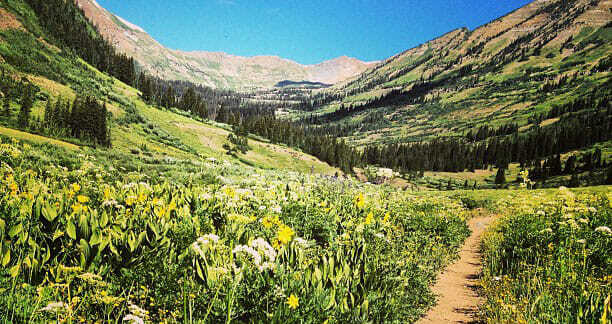 Cool Crested Butte Trail photo by ElCapitan. I’m signing up for the Dallas Marathon for next December. Normally this wouldn’t be that big of a deal (I’ve done a bunch of them) but I’m set to delivery baby #3 in April and turning 40 in November…throw in some complications and the fact that I’m already on restricted activity with more likely in the future (pregnancy related) and I desperately need a goal. Wow September! It’s gonna be a big year for you. Good luck on all of those things! My resolution this year is to eat better food. Not necessarily “better for you” food, just better. I don’t want to eat out as often, little or no fast food, and when I do eat out, I want it to count- not the big chains with their mediocre fare. I want to spend my hard earned money on really good experiences and really great food- whether I make it or someone else does. I think this actually may translate into “better for me” too, so… yay! bonus! I began 2013 120 pounds overweight, my knees, hips, and ankles hurt so badly that I could only walk a short way and that with a cane. I was crippled and horribly handicapped. I started a low carb, low fat, high protein diet the third week of January. Today, I weighed in 75 pounds lighter and I’m now virtually pain free. I’m now walking with a friend about two miles a day. Who knew that losing 75 pounds would enable such a drastic change. So, for 2014, I’m going to continue what I’ve been doing and maybe up my walking a little more. I am hoping to be down the 45 pounds to my goal weight by the end of summer. I would really like to thank you, Nick, for doing what you do so very well. I’ve been able to use some of your recipes while on this diet and your humor and good writing have kept me going. I wish you the very best for the coming new year!!!! Hey Pamela! Thanks for sharing! That’s amazing and good luck on continuing the journey in 2014! I started before 2013 ended. A healthier diet & more exercise. I would like to lose weight & improve my health overall. I would also like to be happy & take time to “smell the roses”.